Siroflex Instant Paintable Caulk is a high quality acrylic sealant specifically developed to be overpainted with water based and synthetic paints instantly after application, without cracking or discolouration. This product is for interior use and adheres perfectly without the use of a primer. This product has low odour, is easy to apply and not corrosive towards metals. 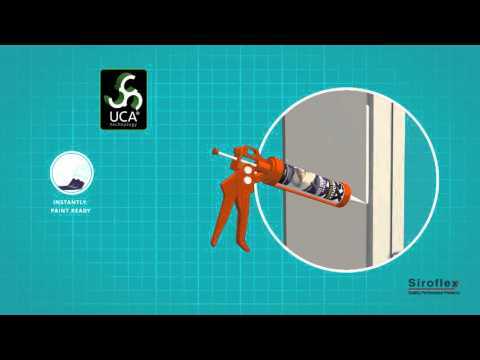 Siroflex Instant Paintable Caulk is ideal for the sealing and filling of gaps and cracks where movement can occur, such as those between plasterwork and window frames, door frames, skirting boards, windowsills and architraves. For filling cracks and screw and nail holes in walls and ceilings. Use prior to painting and wall papering to prevent unsightly cracks developing later. Has good adhesion without primer on concrete, brickwork, plaster and painted wood. Surfaces must be clean and solid. Use diluted product as a primer for highly porous surfaces. Cut the cartridge seal and screw on the nozzle which should be cut to the required size. Using a skeleton gun, apply the sealant into the gap or joint ensuring a good solid fill. If required, place masking tape along edges removing within 5 minutes of application. Always tool using a spatula or stick wetted with water within 5 minutes of application. Uncured sealant can be removed with water. Can be over painted with water based and synthetic paints immediately providing a skin has formed.